Millennium Recycling Keep VHS Tapes Out Please! VHS Tapes are NOT recyclable in the Sioux Falls single stream. Today, VHS tapes sit around in basements and closets, gathering dust, while the old videos stored on them slowly degrade. VHS and cassette tapes are a classic example of a dead technology. Replaced by DVDs, CDs, and digital media, there are too many of them to be valuable and they’re still not old enough to be interesting. Even thrift stores usually turn them down as donations. Why can’t they go in the recycling bin? 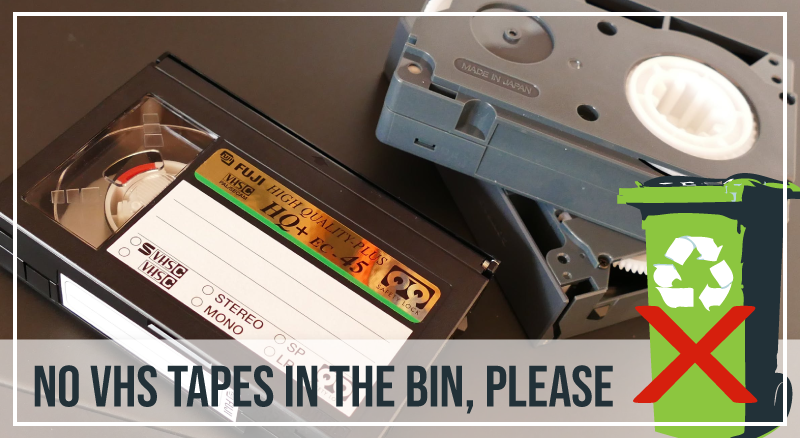 If even one VHS or cassette tape makes it in the recycling bin, it can cause great damage to the recycling equipment. The “stringy” makeup of VHS tapes are horrible for the process and can completely shut down the equipment if they get wrapped up (See more about the problems caused by stringy items in Sioux Falls). Why shouldn’t they go in the landfill? VHS tapes are made with plastics, that will never biodegrade, and ribbon that is coated with iron oxide and other metals, some of which are hazardous – this earns them the classification of electronic waste, or “e-waste.” This means you shouldn’t just dump your old tapes in the landfill—as those metals may eventually leach out, potentially contaminating the surrounding water and soil. Because it’s so difficult to recycle VHS tapes, there are not a lot of options for recycling them. Luckily, there is a local electronics recycling company in Sioux Falls that accepts them called SEAM. They do charge a small, per pound fee for processing. You could also potentially find some reuse options, if a thrift store or library will accept them. If you have a rare or collectible movie on VHS, you may be able to sell it online using a site like Ebay. Thank you for keeping VHS tapes out of the recycling bin! There are 0 comment. on "Keep VHS Tapes Out Please!"